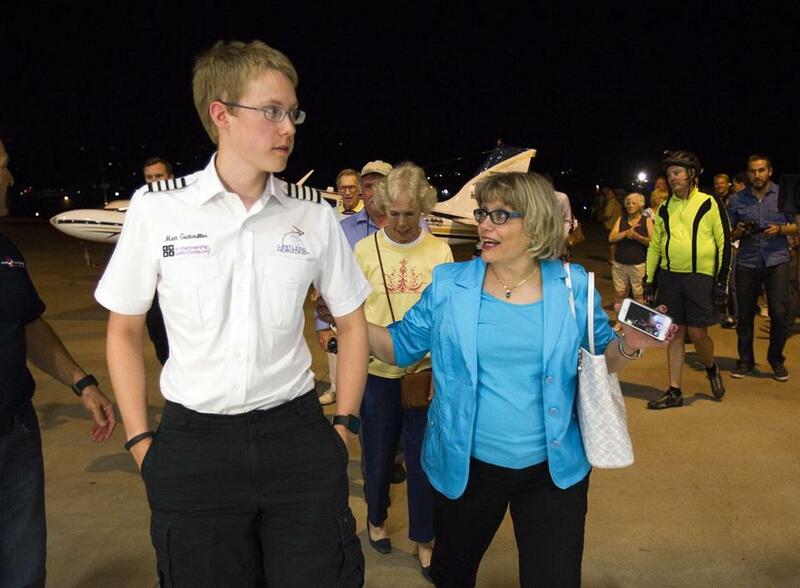 Matt Guthmiller, right, walks with his mother Shirley after arriving in El Cajon, Calif. on Monday at the completion of his solo around-the-world flight. For a 19-year-old-kid who just flew a small plane around the world — setting a record in the process — MIT student Matt Guthmiller seemed to have mixed emotions that his extraordinary six-week journey had come to an end. Guthmiller became the youngest person to fly around the world alone. Guthmiller, of Aberdeen, S.D., flew a six-seat 1981 Beechcraft A36 Bonanza about 27,000 miles over 44 days and roughly 170 hours total in the air. He removed two of the seats to make room for additional fuel tanks. The last leg of the trip — from Honolulu to El Cajon, Calif., outside San Diego — took 15 hours and 43 minutes. His son’s first minor setback occurred in Abu Dhabi, when someone servicing the plane accidentally put in diesel engine oil instead of aviation gas, “but [Matt] caught it and they had to put in a new fuel filter and fuel pump after they flushed everything out,’’ Allen Guthmiller said. A bigger issue occurred when Matt was flying from Pago Pago in Samoa to Honolulu and he encountered storms, and what was supposed to be one 15.5-hour flight instead became a 16.5-hour flight with another flight added of just over an hour because he had to reroute to Hilo, one of the southern islands in the Hawaiian chain. Guthmiller contracted with a firm that helped plan the trip and lined up hotels for him to stay at. During a stay at a Starwood Hotel in Athens, when the general manager found out what he was doing, he said, he put him in a very nice complimentary room and invited him to dinner with him and his family, who then gave him a private tour, snacks, and water for the trip. “And they did my laundry for free,” Guthmiller said. One of the people supporting Matt was the plane’s owner, Michael Borden, of High Performance Aircraft in El Cajon, who also kept in touch with him daily. Borden said he never doubted Guthmiller — or his plane’s capabilities — but is glad he’s back safely. Guthmiller is not the only pilot to make history this month. On July 11, a Denver woman named Amelia Rose Earhart, 31, completed a trip around the globe that her namesake, Amelia Earhart, began in 1937. Amelia Earhart disappeared over the Pacific Ocean before she could finish. Amelia Rose Earhart and a copilot took off from Oakland, Calif., on June 17 and made 17 stops in 14 countries for a total of 24,300 miles in a Pilatus PC-12 single-engine plane. Guthmiller is raising money through a nonprofit organization, Limitless Horizons, to fund the trip, which is expected to cost $145,000. Guthmiller’s goal was to raise $250,000 and donate excess funds to code.org, a nonprofit organization that promotes the teaching of computer skills. He declined to say how much he has raised so far and said the money is still coming in.